Kyi, a mother of four and a loving wife; the 111th was Lhamo Kyab, a forty-three-old forest guard; the 25th self immolated person was a 22-year-old monk named Tenpa Darjey. These are people who had families and friends yet resolved to such drastic measures – why? Imagine, living in a country, your own country and not being able to speak in your language, or raise your national flag, or practice your religion and beliefs. In a free world, we fight for freedom of speech, imagine not having the basic right to live. The human race is designed in a way that we take what’s rightfully ours – by fight, by peace, by love, by war, by hook or by crook – because it’s ours — it’s my damn birthright to be free. Not very far from India, where I live, is a country denied just that: Freedom, freedom for anything and for everything. I believe people don’t belong to a country, or a religion, they belong to a cause: a cause that is so deep ingrained in their blood that it becomes the sole purpose of their lives, the sole reason they wake up every morning. 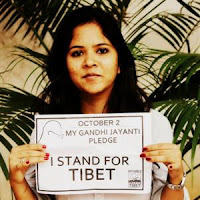 Every Tibetan, that student in your class, that lady who lives right across the street, that Tibetan man you see every day, is a Freedom fighter who has been relentlessly fighting for what’s rightfully theirs for decades now. The second generation of Tibetans who were born and brought up in exile, face the ultimate identity crisis: ”I’m a Tibetan. No, I wasn’t born in Tibet. No, I’ve never even been there. No, I can’t just march back into Tibet whenever I want. I would love to but I can’t.” Educated, internet savvy, a generation of coffee and Facebook addicts, they dedicate their lives to the struggle. There’s always an alternate choice – you can join the regular world, churn out day after day’s worth of paperwork, and go home with a big fat pay cheque or you devote your life to that one reason – that itch to change the world for better. We live in the 21st century, and communism, oppression, repression should be concepts of history, not the reality of a country. Tibet has since 1959, seen deaths and blood of their people, they have seen the charred bodies of 117 loved ones, all because of China and it’s sadistic need to control and oppress. My problem is that China is on its way to become a superpower, and the world doesn’t see it yet; but I believe that magnitude of power and control in the wrong hands will be the end of the world. The hope for me lies in this generation of Tibetans and their supporters who have chosen the alternate path, the struggle for freedom. It doesn’t come easy; they lose family and friends, live in constant fear of being discovered and their families in Tibet are killed or imprisoned because they protest here, the way back home seems lost to some but every time, with every protest, freedom seems just a bit closer. This fight for liberty, freedom and equality is the epoch of a better change, is the epoch of fearless people, it’s the beginning of a Brave New World! NOTE— Rashi Jauhri is a freelance journalist and Human Rights’ activist based in India. She is an ardent supporter of the Tibetan freedom movement. This article has been initially published by the Brave New World. It's difficult to find knowledgeable people in this particular subject, however, you sound like you know what you're talking about!